Image Source: NASA/JPL-Caltech/Cornell Univ./Arizona State Univ. NASA researchers have confirmed that the oddly shaped rock that appeared on Opportunity's cameras is a fragment from a larger rock broken by the rover's wheel. Researchers at NASA's Jet Propulsion Laboratory have solved the mystery of the jelly doughnut-shaped Martian rock. The rock, dubbed Pinnacle Island, appeared on January 8. Images from the Opportunity Mars rover showed that the strange rock had not been present four days before. The rock's appearance fueled jokes about Martians and even a lawsuit that alleged the rock was in fact a fast-growing fungus that NASA was obligated to investigate. The real source of the rock is much more mundane. Further photos from Opportunity show a larger piece of similar-looking rock uphill from where Pinnacle Island appeared. 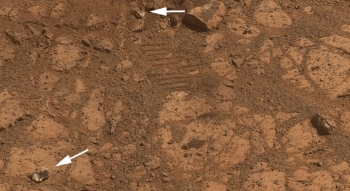 Treads in the Martian surface show that the rover drove over the original rock, breaking off a piece and moving it to its current location. "Once we moved Opportunity a short distance, after inspecting Pinnacle Island, we could see directly uphill an overturned rock that has the same unusual appearance," says Opportunity Deputy Principal Investigator Ray Arvidson of Washington University in St. Louis. "We drove over it. We can see the track. That's where Pinnacle Island came from." Analysis of Pinnacle Island showed that the white and red rock has high levels of manganese and sulfur. These elements are water soluble, and their highly concentrated presence in the rock suggests the action of water. Opportunity will now move on to explore a ridge that is known informally as the McClure-Beverlin Escarpment. The name honors engineers Jack Beverlin and Bill McClure, who risked their lives to save the Mariner 6 craft on February 14, 1969. During a routine test, several valves failed to close, causing the Mariner 6 craft to lose pressure. McClure and Beverlin received the NASA Exceptional Bravery Medal for preventing the destruction of the spacecraft. Mariner 6 and 7 was the first successful dual mission to Mars. February 14 marked both the 45th anniversary of Beverlin and McClure's actions and the Martian solstice. Opportunity's solar array will now have more solar energy available each passing week.